Update: It’s official! Krell is now live in Total War: Warhammer and he can be summoned into battle for free. The patch is live now and contains only Krell. Creative Assembly also revealed that he is, in fact, the ‘old friend’ they’ve been teasing. I wish I had an old friend who could murder 20 people in a single swing. The Norsca DLC has also just been announced. Read up on ice dragons and Fimir with the Norsca army roster in Total War: Warhammer. Original Story: A DLC entry titled Total War: Warhammer – Krell has appeared in the game’s Steam database, strongly suggesting that the former Chaos champion-turned-Wight will be making an appearance in Creative Assembly’s fantasy strategy game. Here’s the DLC listing for Total War: Warhammer at SteamDB, and here’s Krell’s page. Neither gives much away other than to suggest that Krell is coming. Needless to say, following the link out to Steam just bumps you back to the store front. Krell is one of the oldest characters in the Warhammer tabletop game – both in its fictional lore and in the real world. He was once a Chaos Lord dedicated to Khorne, and killed a lot of Dwarfs before eventually meeting his comeuppance. He was resurrected by the big bad necromancer Nagash as a powerful Wight, then fell into the service of Heinrich Kemmler, the Lichemaster. 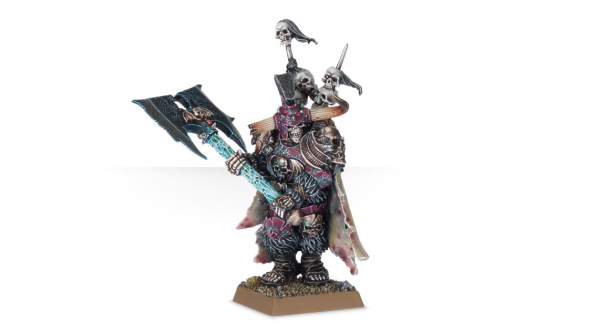 Expect him to join the Vampire Counts faction, to buff Wight units, and to have some kind of interplay with Kemmler. The question now is how he fits with Creative Assembly’s content plan. Speculation on the Total War subreddit is rife that Krell is the ‘Old Friend’ listed as the terminus of CA’s free DLC schedule, and ostensibly, he would fit: Krell’s first appearance was alongside Heinrich Kemmler in the 2nd edition campaign ‘Terror of the Lichemaster’ from 1986, which certainly makes him old. So it seems Krell is not our old friend and thus may or may not be free DLC. But it’s pretty likely he’s coming, either way, so that’s good news.